I'd like to share something that's making me smile. 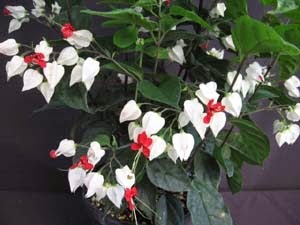 For Christmas, my 'almost family' gave me a bleeding heart vine. I'd never seen one before - turns out it's native to West Africa but can grow here as a house plant. When we returned from holiday, all the flowers had died. I trimmed most of them off (hoping to encourage more), but left a few by mistake. As I was trimming off the dead flowers, I'd noticed a green 'knob' in the base of some of them. In the flowers I'd left on the plant these had burst open, revealing a shiny black seed coated with orangey-red powder. Two of the remaining flowers have these and I think they're stunning! It also has deeply veined leaves that look beautiful with the light behind them.